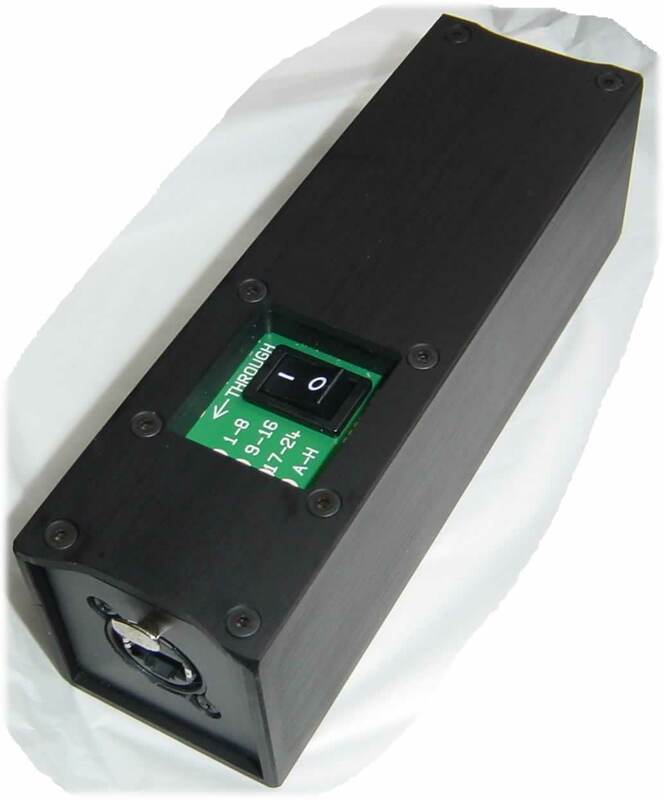 BrikWorm is a digital alternative to a conventional analogue multicore. It is lightweight, modular and can be set up or removed in under 10 minutes. It is also the only such system designed and manufactured in the UK. - Traditional - emphasis on minimising length of leads on stage. Stage units are self-contained satellites. cable reel. Guitar case for comparison. So, how does it work? Click on the headings below for the explanation! 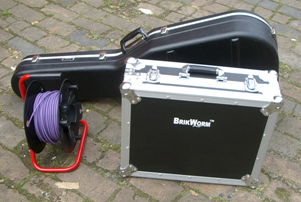 BrikWorm uses each pair of the CAT5 as a transmission line. This means that while signal information can be input only at one place, it can be output anywhere along the line. This is important because it is the basis on which BrikWorm is so modular - Briks can go anywhere in any order, which increases flexibility. Modules which have two Ethercon sockets can be daisy-chained together in any order. HIgh speed data travelling along transmission lines needs termination, otherwise standing waves occur. BrikWorm therefore requires two terminators per system. Ethercon sockets are provided in pairs, so there will always be one socket at each end of the system spare - this is where the terminators plug in to complete the circuit. We use Ethercon-style terminators because it's really obvious whether the terminator is in or out, whereas switches could easily be left 'all in'. The digitised audio signal propagates both ways at the same time along the CAT5 transmission line, therefore you can 'listen' at any point on the line. This makes it possible for monitor splits, feed to a recording medium, feed to another room's PA system if you wish at any point, with zero delay (other than that caused by electricity travelling down a cable!). BrikWorm is not limited to the normal 100m distance. A repeater can be used, powered from the CAT5, to reconstitute and boost the signal in either direction. Thus BrikWorm can run for indefinite distance, as long as there are additional power supplies every mile and repeaters at 100m intervals (max). Power drops over approx 2km. The dotted line below represents voltage. When it's too low it can't supply power to the repeaters therefore a PSU at each end supplies enough power to support the repeaters' requirements. Power travels down the CAT5. This minimises the number of mains connections, making it easier to attach other modules and extend the overall length of travel. If you inject power through the RJ11s on the rear of the TosCAT, it comes out of the Ethercons on the front; if you inject through the Ethercons, it comes out via the RJ11s. Setting up (eg gain, phantom power) can be done remotely and locally via standard midi control.